Apple’s latest product unveiling was dominated by Oprah, Jenifer Anniston and even Sesame Street’s Big Bird revealing Apple TV+, the firm’s rival to Netflix. It was another announcement though that really caught our attention: the Apple Card! For years there has been speculation about the tech giants setting foot in financial services, and this exciting development marks the first thundering step of the world’s biggest tech company. To test the interest among UK consumers (the card is initially launching in the US, with no date for Britain yet announced) we ran a quick survey the day after the announcement using our Harris 24 solution. The public have more trust in technology companies than credit card companies: 39% have quite a lot or a great deal of confidence in technology companies, compared with 31% for credit card companies. Perhaps unsurprisingly as a retailer, Amazon is a more popular choice to offer a credit card (27% would be likely to take out a credit card with them) with Apple and Google tying (17% and 18% respectively). 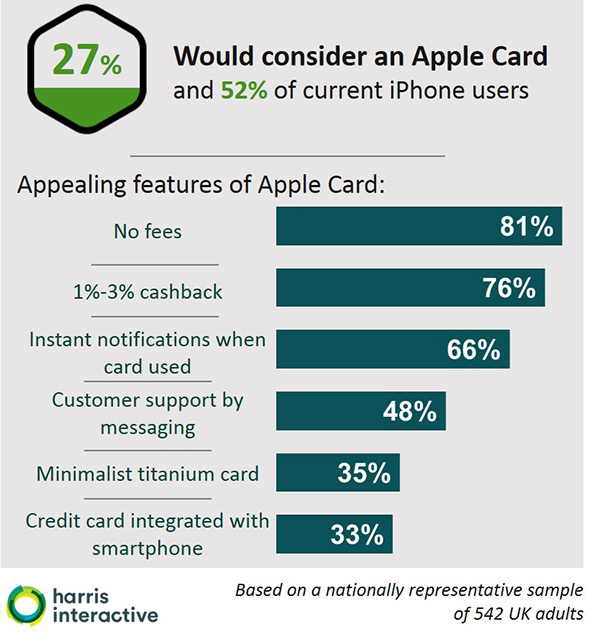 Once shown the benefits of the Apple Card, a quarter (27%) would consider getting one, rising to a half (52%) of current iPhone users. As a benchmark we also compared likelihood to take out credit cards with an established credit card company: Barclaycard. Half (52%) said they would take out a card with them – twice as many as for Amazon and four times as many as would take out a card with Google or Apple. Paypal, who already have an offering “like a credit card without the plastic”, attracts a third (36%). So whilst there is more trust in tech companies overall, this has not yet translated into consideration for financial products. As consumers become more familiar with Apple and others offering credit cards though, they are likely to close the gap. The most appealing feature is the promise of no fees: four in five (81%) find this appealing or very appealing. Also highly appealing are instant notifications when the card is used (two thirds find this appealing or very appealing), a common feature from Fintechs. Another interesting finding we uncovered in the data is not only are iPhone owners more positive about an Apple credit card, but they are more open to having a credit card with any of the companies. Furthermore, compared to users of other smartphones, iPhone owners are younger and have a higher household income. This reveals another point in Apple’s favour: they have ready access to more financially active consumers. Finally, we looked at how the announcement of the Apple Card might impact iPhone purchase. Overall, one in five (19%) said it would make them more likely to buy an iPhone in the future. This was a third of current iPhone owners and one in six (15%) owners of other smartphones. This announcement has implications for both the financial and technology sectors. 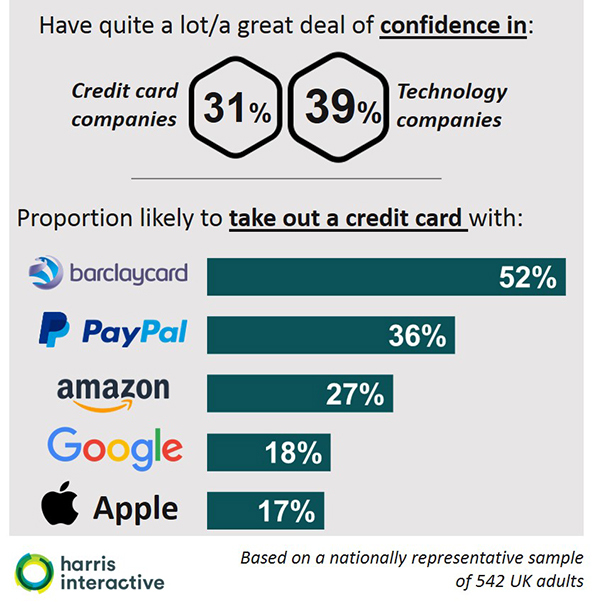 Commenting on the results of this research, Michael Worledge, head of financial services research at Harris Interactive said: “The Apple credit card is sure to be popular. A lot of people are very wedded to their suite of Apple products, so why not have their credit card too? But it’s not just Apple and their credit card, it’s bigger than that. It represents the next move of tech providers into financial services. Providers from across FS should keep an eye on how it does and continue innovating, providing better products and experiences for consumers”. Fintechs have been disrupting financial services for years. They have grown phenomenally but are restricted by limited resources and not yet being long-established household names. Fintechs pride themselves on their seamless user experience. As one of the world’s richest companies Apple clearly has the resources and the expertise to create a slick offering; and this is apparent from the previews they have released. Apple also benefits from being a well-known brand with millions of existing customers. This could help them reach beyond the early adopters who have embraced Fintech so far. Could Apple disrupt the disrupters? We surveyed 542 UK adults on Tuesday 26th March 2019. The results are weighted to be representative of the UK population by age and gender.